By Cat Rambo & Fran Wilde, SFWA 50th Anniversary Cookbook editors. 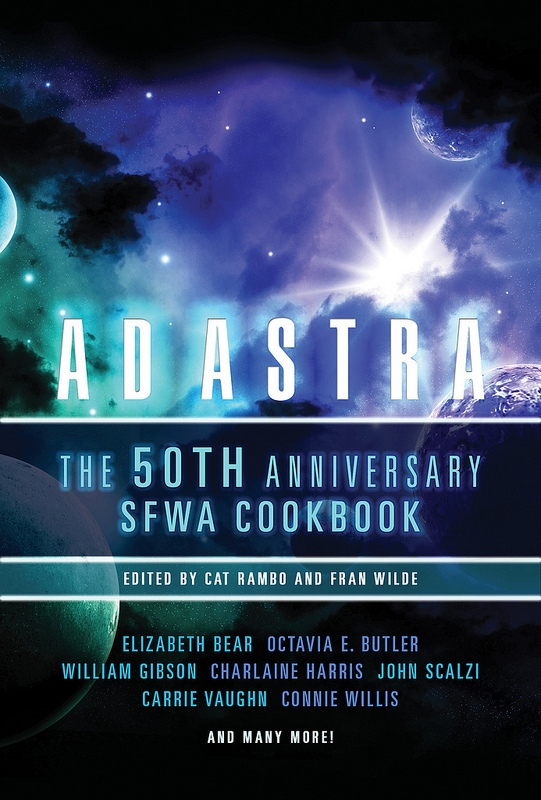 In celebration of fifty years of the Science Fiction and Fantasy Writers of America, Ad Astra: The 50th Anniversary SFWA Cookbook collects recipes old and new from writers across the span of its membership. This is more than just a cookbook. It’s a historical document, tracing the history of SF/F entertaining back more than fifty years. Mix over a period of a year, then proofread carefully. 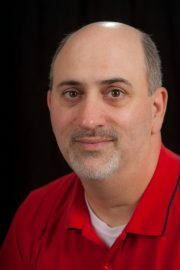 Donate all proceeds to the SFWA Legal fund. The SFWA 50th Anniversary cookbook full contributors’ list: Rachael Acks, Cie Adams, Kyle Aisteach, Anna D. Allen, Lou Antonelli, Liz Argall, Elizabeth Bear, Greg and Astrid Bear, David Brin, Maurice Broaddus, Charles N. Brown, Steven Brust, Octavia E. Butler, Pat Cadigan, James L. Cambias, John F. Carr, Gail Carriger, Beth Cato, Jeanne Cavelos, C.J. Cherryh, Wesley Chu, Brenda W. Clough, Tina Connolly, Larry Constantine, A.C. (Ann) Crispin, Julie Czerneda, Jack Dann, Russell Davis, Aliette de Bodard, Ef Deal, Carole Nelson Douglas, Scott Edelman, Ru Emerson, JG Faherty, Eugie Foster, Esther Friesner, Gregory Frost, Russell Galen, Jaym Gates, William Gibson, Laura Anne Gilman, Sarah Goslee, Chet Gottfried, Talia Gryphon, Rebecca Gomez Farrell, Eric J. Guignard, Joe Haldeman, Gay Haldeman, Lee Hallison, Barbara Hambly, Charlaine Harris, Erin M. Hartshorn, Jim C. Hines, M.C.A. Hogarth, Nalo Hopkinson, Dean Ing, Elaine Isaak, Julie Jansen, K.V. 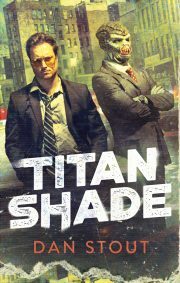 Johansen, Alaya Dawn Johnson, Rosemary Jones, Vylar Kaftan, Jeffe Kennedy, Kay Kenyon, Ellen Klages, Alethea Kontis, Mary Robinette Kowal, Nancy Kress, Jay Lake, David Glen Larson, Nicole J.LeBoeuf, Yoon Ha Lee, Ann Leckie, Stina Leicht, David D. Levine, Maria Lima, Mary E. Lowd, Natalie Luhrs, Catherine Lundoff, Scott Lynch, James D. Macdonald, Ricia Mainhardt, Michael J. Martinez, Mary Mason, Vonda N. McIntyre, Victoria McManus, Jennifer Melchert, P. Andrew Miller, Jaime Lee Moyer, John P. Murphy, Mari Ness, Teresa Nielsen Hayden, Larry Niven, Sharyn November, Stephanie Osborn, Andrew Penn Romine, Aly Parsons, Sarah Pinsker, Marianne Porter, Jerry Pournelle, Tim Powers, Marta Randall, Cat Rambo, Mike Resnick, Tansy Rayner Roberts, Spider Robinson, Michaela Roessner, Mary Rosenblum, Patrice Sarath, Steven Saus, John Scalzi, Ken Schneyer and Janice Okoomian, Lawrence M. Schoen, Nisi Shawl, Charles Sheffield, Fraser Sherman, Steven H Silver, Rosemary Claire Smith. Cat Sparks, Bud Sparhawk, Nancy Springer, Jennifer Stevenson, Bonnie Jo Stufflebeam, David Lee Summers, James L. Sutter, Michael Swanwick, Mary Vigliante Szydlowski, Lynne and Michael Thomas, Kathy Tyers, Mark L. Van Name, Carrie Vaughn, Ursula Vernon, John Walters, Brent Weeks, Miriam Weinberg, Chuck Wendig, Toni Weisskopf, Fran Wilde, Sean Williams, Walter Jon Williams, Connie Willis, Mercedes M. Yardley, Jane Yolen, and Kate Yule.